Hi Guys! Today I’d like to share with you the progress I’ve made on the boys’ new shared bedroom. 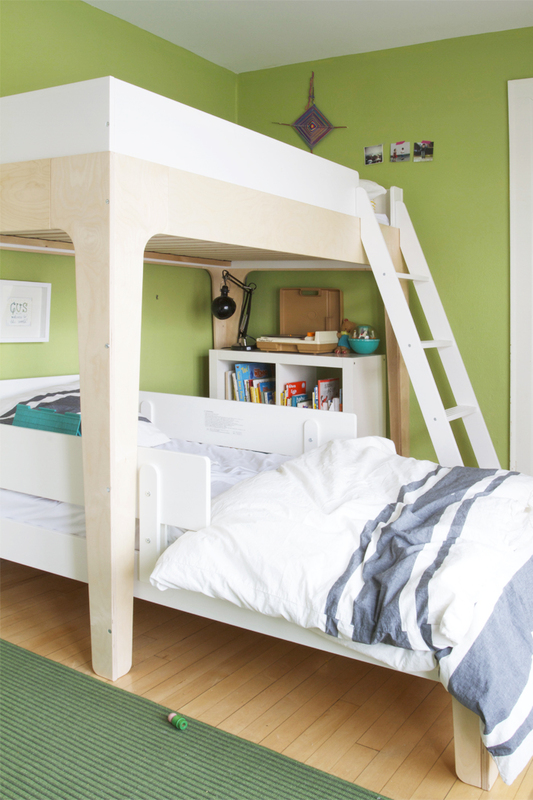 Just a little background info, Finn and Gus are 5 and 2, this fall we invested in a modular bunk bed from Oeuf. In was a significant investment for us, but the bed has a lot of potential for repurposing down the road, this seemed like the right choice for us. The biggest benefit is that the bunk bed can be split into two beds, so when the time comes for these guys to break up, they can leave the relationship with a twin bed a piece. It is important to us that the boys share a room. As kids, both Jeff and I shared a room for a period of time with our siblings – I’d like to think it helped create relationships with our bros. Our hope (fingers crossed) is that having the kids bunk together will help them bond and grow as brothers. I’m looking forward to, and have enjoyed the mischief that has resulted from this so far. It’s been quite the task combining two boys into one room. They both have different interests and toys that they like to play with. We went through everything! I mean everything, toys, clothes, artwork and furniture. I/We figured out what needed to stay and what could go. Purging always feels good, and I try and do it once a year, but this job was a really big one. We had piles of stuff to donate, piles to hand down, piles of toys that still had life in them, and piles of sentimental stuff that needed to be put away in storage. There was also the task of combining furniture and rearranging artwork – basically making it all look somewhat cohesive and less of a hot mess. As a mom who remembers quite well what it was like to be a kid, I tried to fill this room with lots of “discovery” spaces (aka awesomely cool secret play spots) for the kids. I’ve mentioned in the past, that this room is the ideal kids room. Both boys have closets on either end of the room. In each closest is a dresser and a built in toy chest. I added lighting to each closest and made play spaces for each of the boys. Gus has his Fisher Price toys and matchbox car obsession to keep him busy in his space. Finn has his Lego collection and his new Playmobil castle set up. I also made a tiny reading/record listening corner nestled in between the lower bunk and the bookshelf, and have plans of adding a small book shelf up in top-bunk-land for Finn, who has been picking up reading very quickly. Did you spot the TV in the room? This is a more recent addition. A few things about this TV – it’s not hooked up to anything, in order for the boys to watch TV up in here they need permission and most often it needs to be a special occasion – like a sleepover. Also, our small guy Gus, gets sick often and has to have nebulizer treatments for his lungs multiple times a day. The TV is a good distraction for him while he lays in bed getting his neb on. Can we talk about green? This color is starting to wear on me, we’ve had this room painted “Asparagus” green for four years – that’s a long time for me. It’s vibrant and fun, but I think it might be time for a change. For now it’s okay, and I’m just fine with that, sorta. 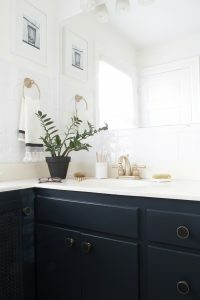 Mostly I just don’t have the energy to put tons more work into the kids room at this present moment – that doesn’t mean tomorrow I won’t be painting that room some new color. 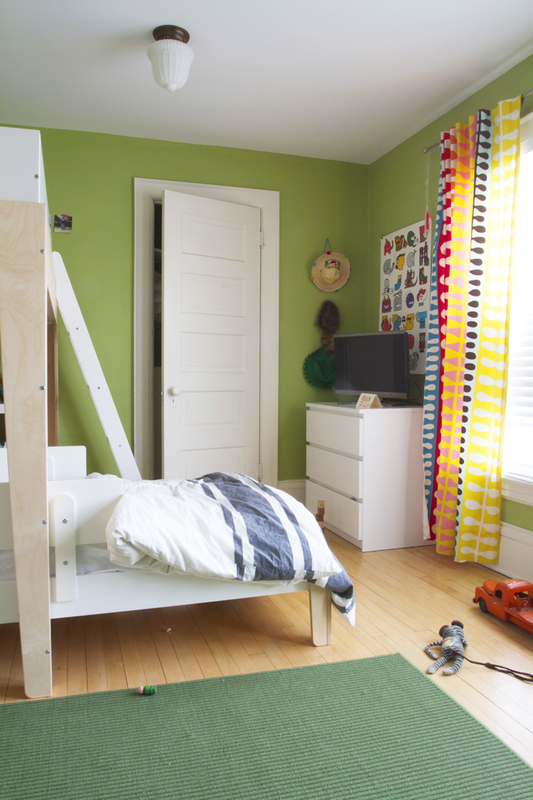 I still have a mega crush on this kids room, and would love to incorporate some new light fixtures and a graphic striped rug into the boys’ room someday. This is one of those times where I just have to sit back and stew on it, if in a few months this rugs still seems so awesome it might be time to consider investing in a few more grown-up pieces. We will see. So this is Finn’s closet, recently organized. 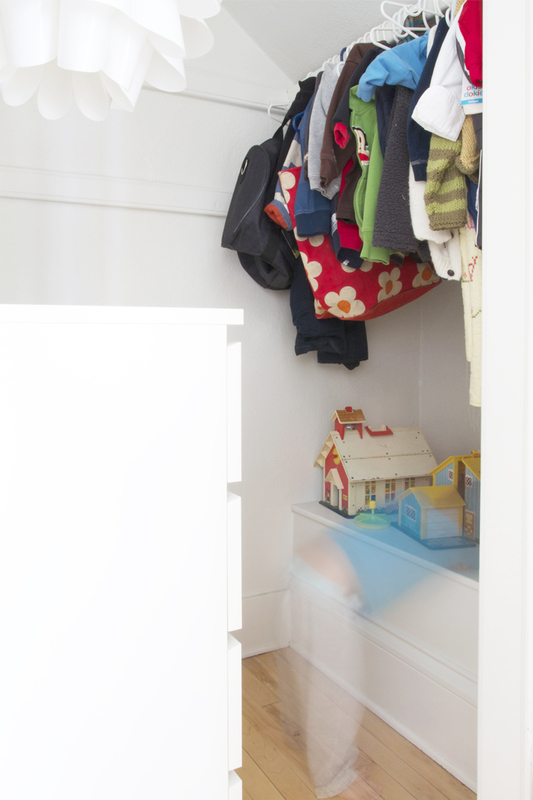 It was a such a mess before – there were legos everywhere, a messy hamper and clothes that were strewn about. It took hours to get this bad boy whipped into shape. It all started with the Ekby shelves from Ikea. I knew we had to add some wall storage to the space, there was just not enough room for everything to be tucked away. 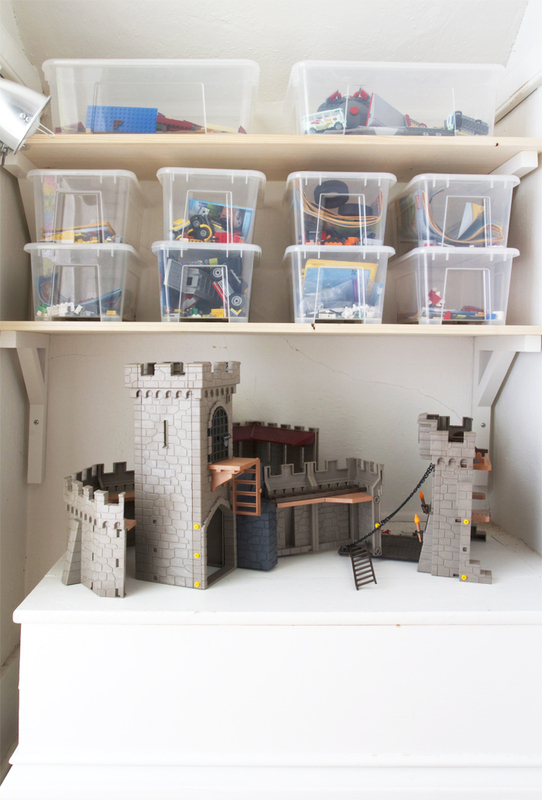 After the shelves were installed, Finn and I began the tedious task of organizing all of his Legos by project, and separating them into these inexpensive and awesome Samla boxes. Seriously $1.49 a piece for these boxes, and they are clear so Finn can see what project he wants to work on easily. After half an afternoon we had everything organized. I grabbed this little clip on light at Ikea for $10 bucks over the weekend and it’s perfect for the space. It’s only been a day since we installed and organized the legos, but I’ve found Finn in there playing on multiple occasions, and he even made an effort to get dressed first thing this morning because his clothes were “so tidy and easy to find”. Mom win! Although we purchased two of these dressers for Gus’ old room, the transition perfectly into the new shared bedroom. Yes, I said there was two dressers for one boy. One is for all his current clothes, and the other is home to all the in between clothes that are passed down from his older bro. 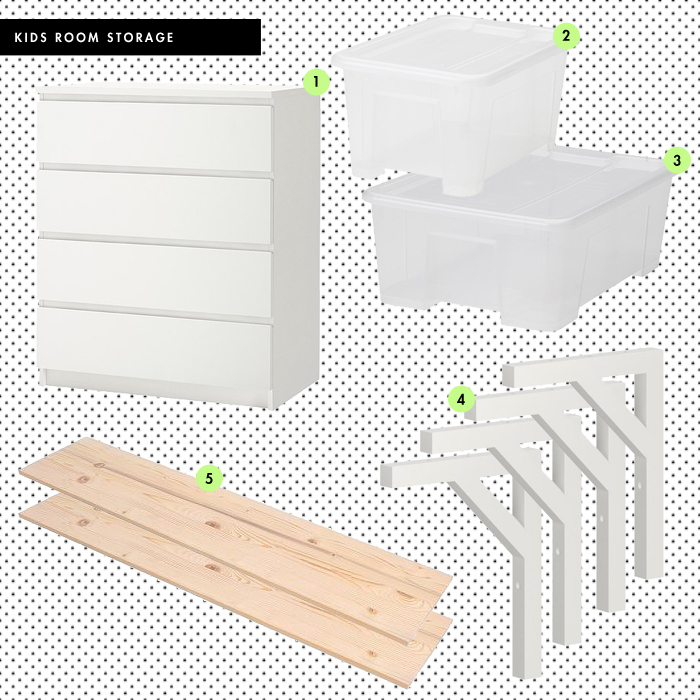 Thank you Ikea for providing me with the most inexpensive storage solutions! I walked away with 10 of these bad boys with lids for $14.90 with the Ikea family member price. The bins are all transparent so the kid(s) can find what they are looking for easily. Also, we have no room for anymore legos. I hope we can keep all the pieces together and they can survive two kids. We bought two bigger storage boxes for the larger Lego sets. The depth is the still the same so they fit nicely on the shelves. These are my new favorite Ikea shelves, I love these Ekby brackets. They are easy to install and I really love the look of pairing them with the natural wood shelf (below). Two raw wood shelves at $4 bucks a pop, not too shabby. 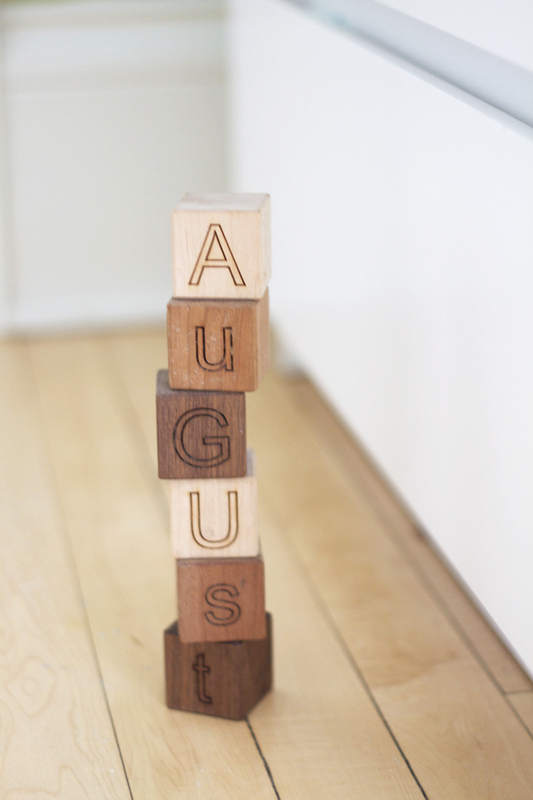 They are easy to cut down without leaving exposed MDF edges. I love ’em. That bunk bed is killer! Kind of jealous lol. Thanks! 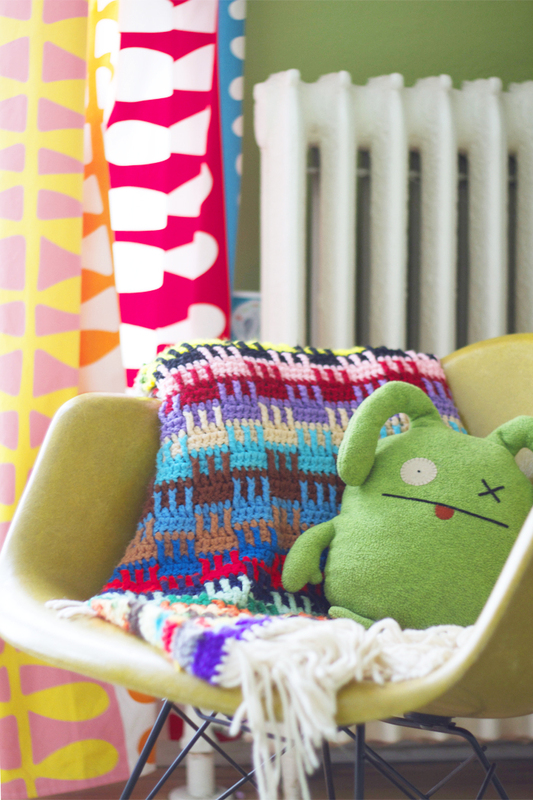 We love it – we’ve had Oeuf furniture before, I can’t recommend it enough! Too cute! I’m really digging that vintage ceiling fixture; did it come with the house? Hey Rachel! Yes, these came with the house, I totally love them too. Sometimes I dream of changing them out for a few years just to change it up, but I do have a sweet spot for these lights. Hi Lori! I too remember trying to make forts and cool secret spots to hang out when I was a kid.. It is so hard being three, you are right. Man, kids, they get all the fun – lucky for us moms it’s part of the job to channel our inner kid from time-to-time. Good luck on making fun kid places, I’m sure you’ll make it awesome. Such a great space! And can I just say how beautiful your actual posts are? Everything is so lovely and formatted and yea… I am insanely jealous!! All of that is beyond me!! Thanks Emily! That means a lot, I really put a lot of thought into the design of the site and posts. Thank you! Hey Shavonda! 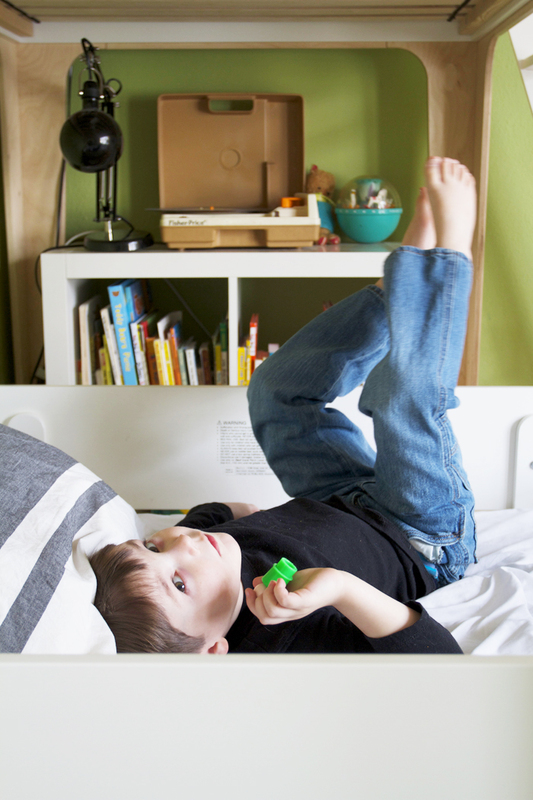 At least kids are good at making mischief even if they aren’t close in age :) Plus, you get to decorate two rooms, that sounds fun too. Hey Sarah, Yeah, I totally go back and forth on the color all the time. 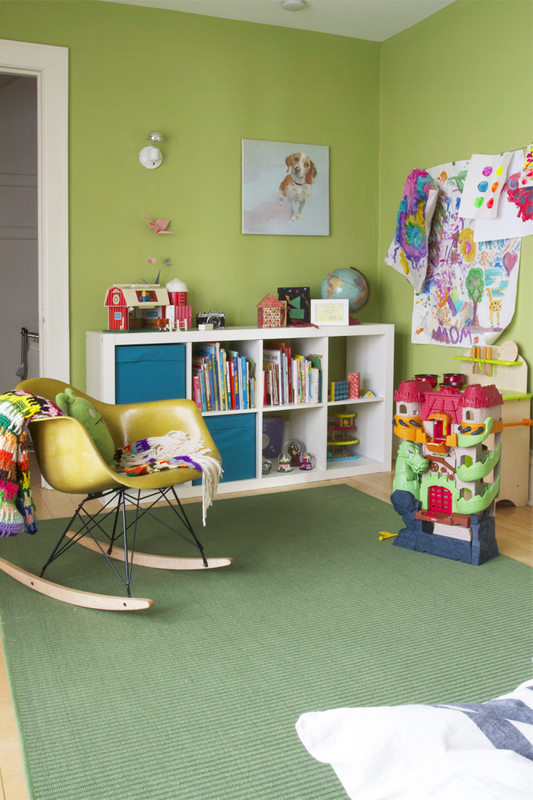 I’m sure it won’t last forever – sometimes I think it’s just that dark green rug that I can’t stand, if I can just change that maybe everything would be better! I would suggest looking on Craiglist for a vintage rocker or even just the shell of a chair. They make really nice bases that are affordable these days (I buy all mine from Modern Conscience), you could get it much cheaper than buying new. Love the duvet covers on the kid’s beds! Where did you get them? Great job on the room! Thanks Mindy! I got the duvets over at Ikea, like all things Ikea they were super affordable and they look great. Here’s the link. I’m loving it! Don’t you just love ikea?! Lucky boys what a great space :-). I actually adore the green walls. My 2 year old boy has a room with white walls and a dark grey feature wall with lots of white furniture and even though I’ve added pops of colour using art and books, I feel it’s not quite bright enough fur a fun loving little person?! Hey Helen! Thanks for the insight! I flip flop on white vs bright color all the time. The white does photograph so well always – but I haven’t seen it enough in real life to know for sure if it’s all that. Something to consider for sure. I also get tired of paint colors so quickly so good job for sticking with it! I do prefer bright colors on the walls for kids though. The white wall trend is spreading like wildfire because it photographs so well (and looks clean and modern – I do really love it) but it never feels quite lively enough for happy little kids. Ha, I just said the same thing in a previous comment reply. Yes everyone loves white these days and it does photograph well. I flip flop all the time over it. My 25 year old me would never believe that I would consider painting white walls, it’s funny how tastes and trends change. I do think I will stick with the green for a bit longer, I’m not convinced of any specific change yet – and jumping into things I’m not sure of usually ends with not-so-good results. Thanks for your input! Hey! I’m not sure if you saw but that offset striped rug from ikea had its price reduced by $100 on both sizes. Just thought you’d like to know! I am also in love with that bunk bed, their room looks great so far. Oh Thanks for the tip Mandolin – I’ll be in the market around March, hopefully they will still be around then. Thanks for looking out for me! How did I miss this blog post?!? I’ve been hanging out waiting to see the boys’ room! It’s fantastic and I love all the little details and hidey places/nooks. 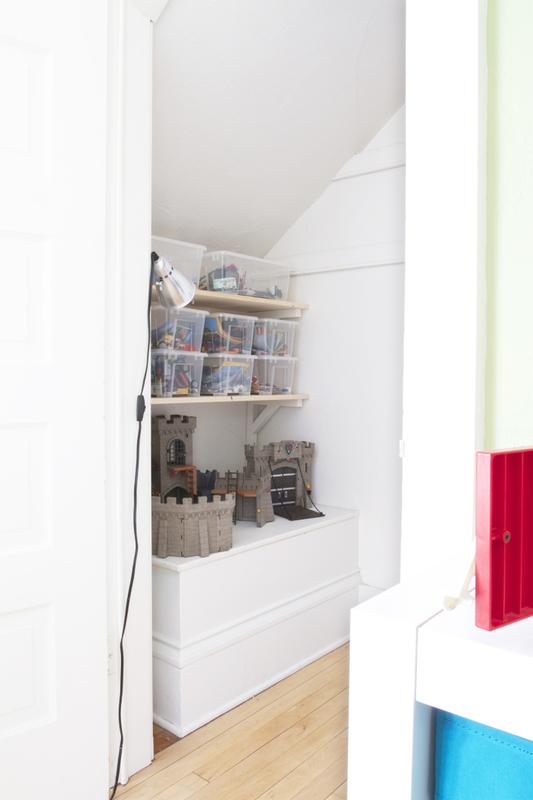 My son would love this… we have tiny bedrooms and he calls the corner of his bedroom between his Toy cupboard and bookshelf his “shed”! It’s got buckets of tools, trains and his ‘treasures’ that I mustn’t touch! Oh to be 4.5 again! 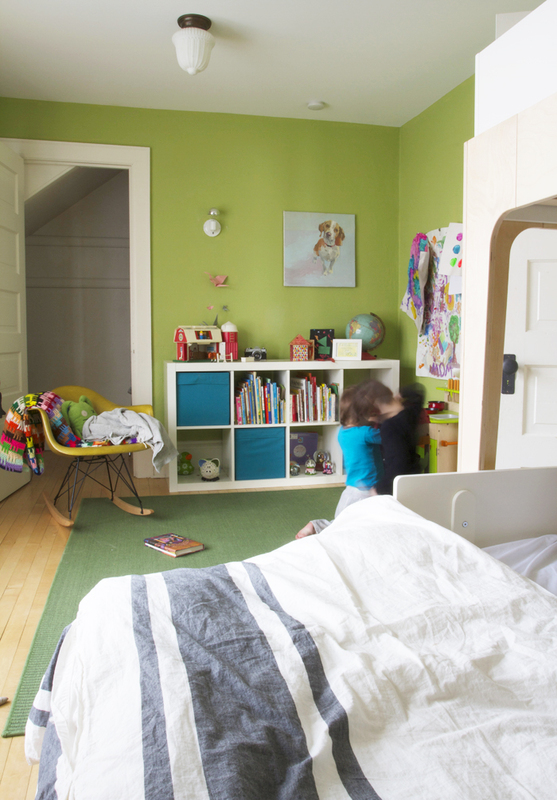 I love your green walls and have a similar but maybe bit lighter colour in my daughters room (I call it pistachio green!) but have been itching to change it lately. Maybe paint 3 walls white and leave a green feature wall??? Thanks for sharing this with us… I’m off to see if I can create some more ‘discovery spaces’, such a great idea! Ha, I love it, his “shed”. I’ve been considering painting 3 walls white too and leave one green, because I do love it, I just am feeling a change coming down. Maybe we should do it! It could also be this time of year, I want to paint everything right now. Eep. So, there’s a repair kit to make the dresser more safe around kids. Just thought you’d want to know!